These Cheddar Cheese Buttermilk Biscuits are really simple and quick to make, so delicious, tender, flaky and super cheesy. 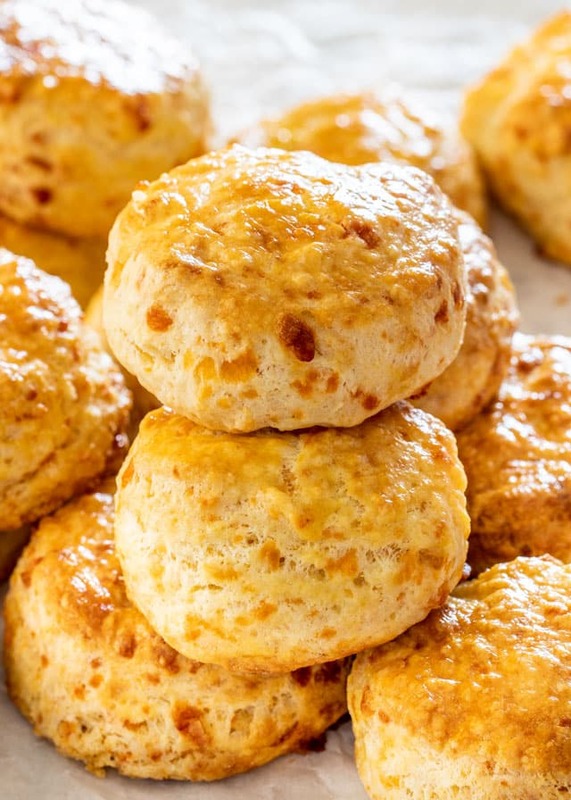 Loaded with cheddar cheese and super tender from the buttermilk, these biscuits are the perfect addition to any meal, or enjoyed as a snack. 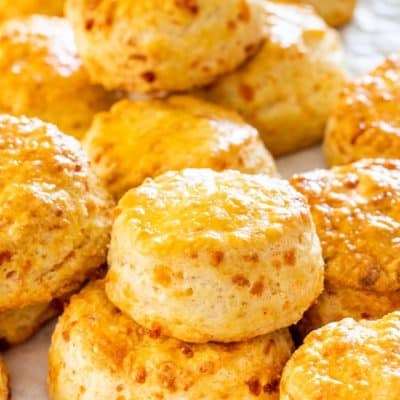 These cheddar cheese buttermilk biscuits are my favorite biscuits in the whole world. I’ve been making them for years now and absolutely love them. This recipe is fool proof, which means these cheese biscuits are really easy to make and pretty quick too. If you are worried that biscuits are a lot of hard work and may require a lot of technique and practice, think again. Biscuits are probably one of the easiest things you can bake. Check out my tips below and you will always end up with the perfect biscuit. 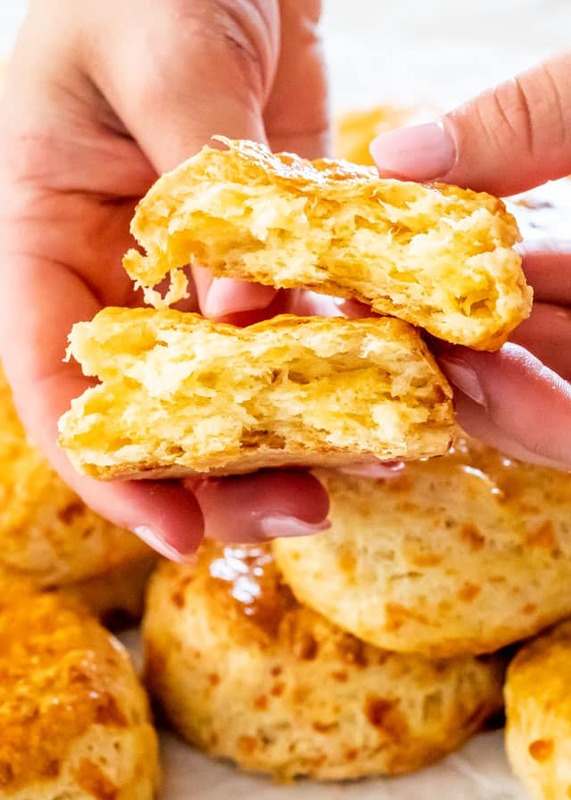 These cheese biscuits are so tender, flaky, cheesy and they smell heavenly. You can cut these any way you want, I usually use a 2 inch cookie cutter to cut my biscuits, but you could cut them square, triangular like scones, it’s totally up to you. The shape doesn’t really matter. As you can see in the video I used a glass, so that works well too. We’re in the middle of a move and all my stuff is packed, so no cookie cutter for me, but the glass worked wonderfully. I could never get tired of making cheese biscuits, the problem is I forget about them, until I see them in a coffee shop somewhere and then I get the urge run home and make them. They are such an easy thing to make and so worth it. Give these a try and do let me know how you like them. Always use cold ingredients. 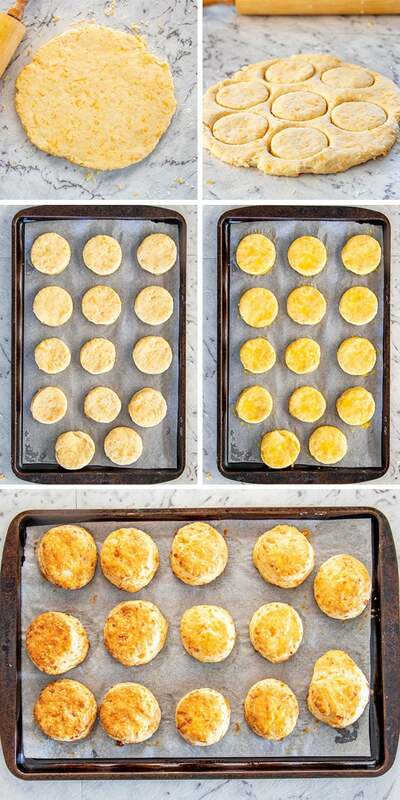 This is the key to a flaky biscuits with separate layers. I usually don’t take anything out of the fridge until I’m ready to use that ingredient in the recipe. Do not over knead and be gentle. The more you work your dough, the more gluten you develop, and the more gluten you develop the tougher your biscuit will be and more prone to shrinking. Remember, treat it with love and be gentle. Use fresh ingredients, specifically your baking powder. The baking powder is what helps the biscuit layers puff up. To test the freshness of your baking powder, mix a spoonful of baking powder with 1/4 cup of hot water. If the baking powder is fresh, it will bubble vigorously. Preheat your oven to 425 F degrees. Line a baking sheet with parchment paper. Whisk the buttermilk together with the cold egg in a small bowl. Set aside. In a large bowl add the flour, baking powder, salt and mix well. Using a pastry blender, cut in the butter until mixture resembles coarse meal. Mix in the cheddar cheese. 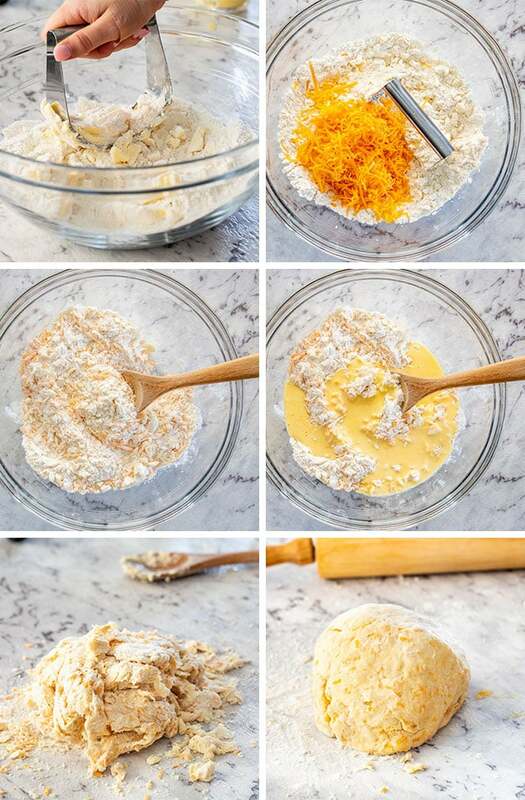 Add the buttermilk mixture and using a wooden spoon mix everything together, then using your hands quickly knead a few times until the dough barely starts to come together. Turn the dough onto a floured surface and continue kneading a few times. Add more flour as needed, if the dough is too wet. Roll out the dough so that it's about half an inch thick to 3/4 of an inch. Brush the biscuits with the beaten egg and bake in the preheated oven for about 20-25 minutes. Transfer to a rack to cool. This dough could also be made in a mixer or food processor. Use cold ingredients to achieve flaky biscuits. Storage: Store biscuits in an airtight container at room temperature for 1 to 2 days. To freeze you can either freeze them before or after baking. If you bake them first, let them cool completely, then transfer them to a freezer plastic bag or airtight container and freeze for up to 1 month. Recipe originally shared September 2013. Question: I’m going to make this receipe tomorrow; confused on the directions regarding #2 & #8…..am I incorporating a cold egg into the mixture? So, do I need an extra egg to wash the outside of the biscuit? 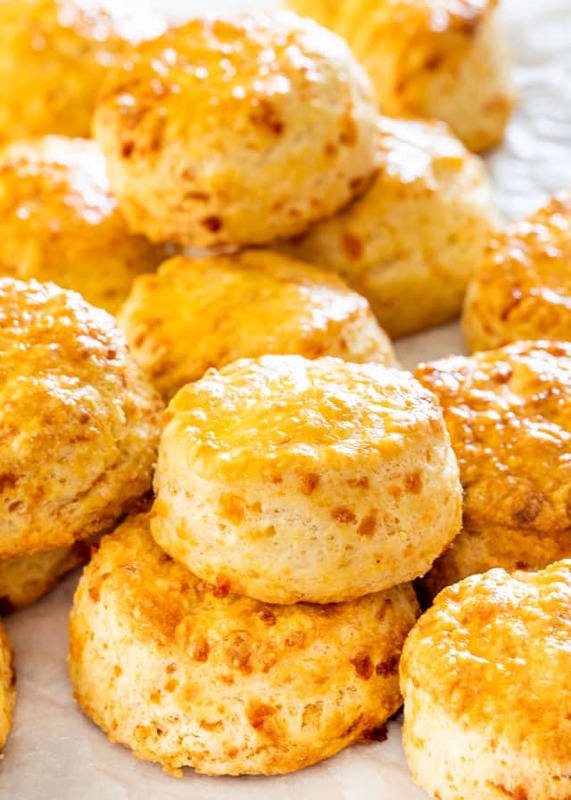 Ughhhhh, just made someone else’s cheddar biscuit receipe, and, it turned out not flaky & flat (*even though my daughter said “it had a good taste”…. I used cold butter & milk….. Yes, exactly! One egg will be for the dough and one egg will brushed on as a wash. My tip for making perfect flaky biscuits is to work nice and quickly. We want all these ingredients to stay nice and cold, and we want pea-sized chunks of butter in the dough to create those fabulous layers. Check out the video we have in the recipe card! Amazing light in weight! Loved this recipe. Easy and delicious, I will be adding this to my regular recipes. These are great! I followed the recipe exactly with the exception of the buttermilk. I was out so I substituted yogurt. So easy to follow your recipe. I used a wide mouth mason jar and got 12 biscuits. My oven bakes hot so I did 19 minutes at 350 and they turned out perfect. Thanks for the recipe. It’s a keeper!